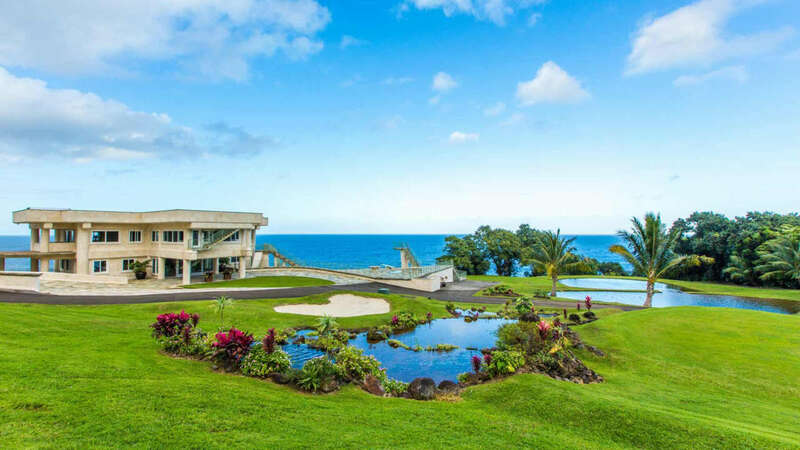 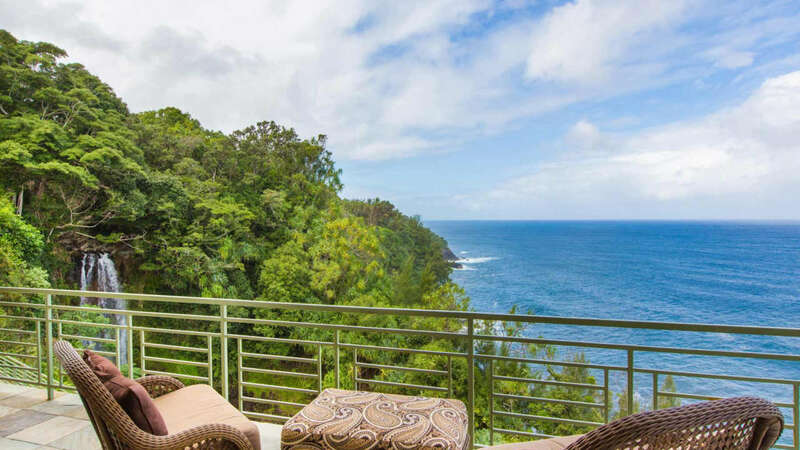 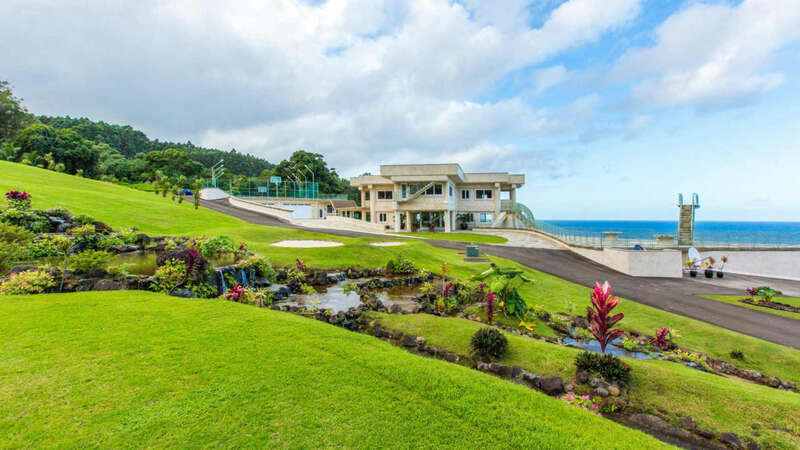 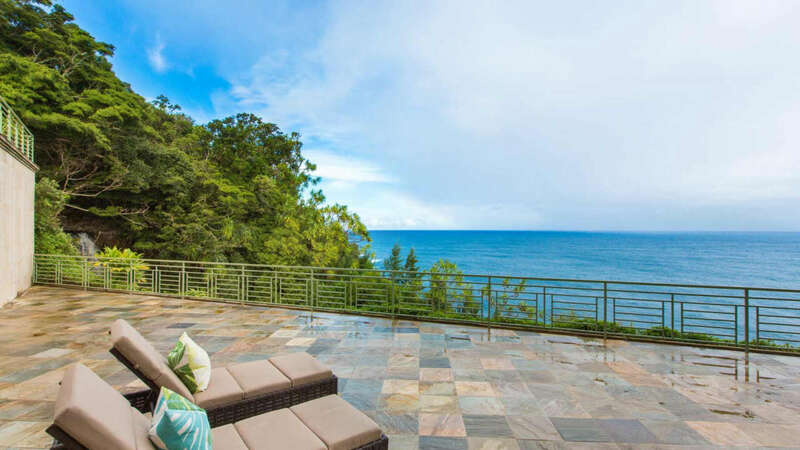 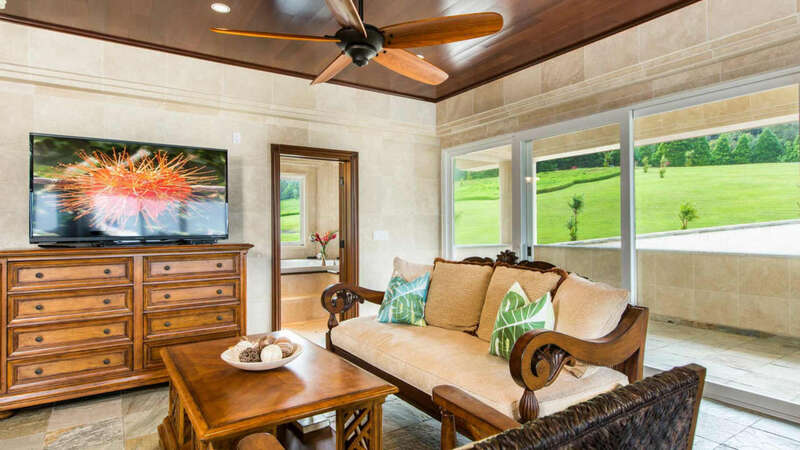 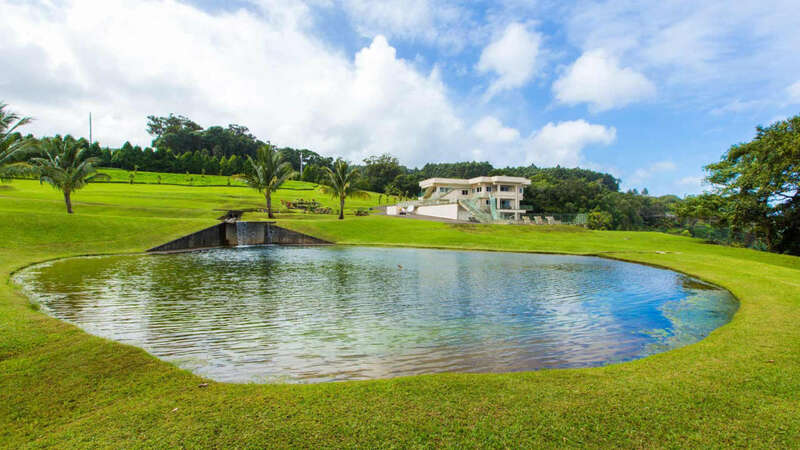 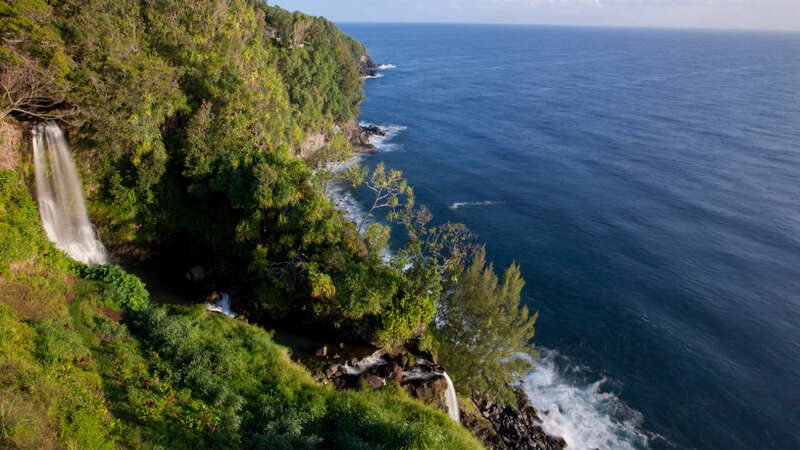 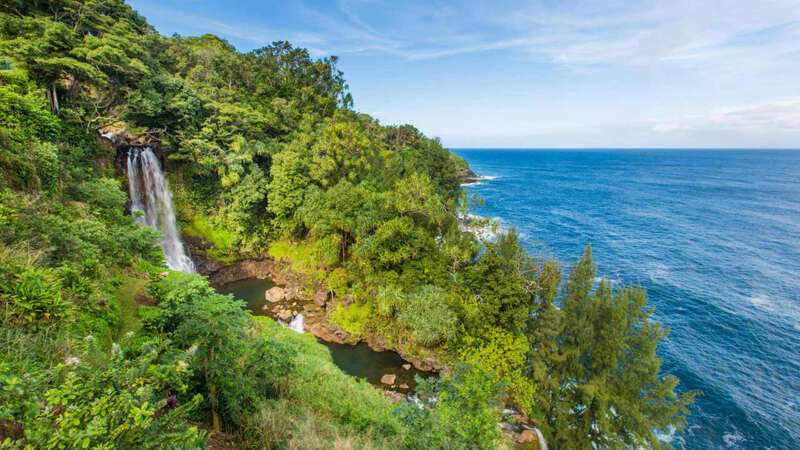 Set on a breathtaking cliff along the Hamakua Coast on Hawaii’s Big Island, this former macadamia nut plantation has been transformed into a jaw-dropping, 9+ acre estate with unparalleled amenities and never-ending views of the Pacific. 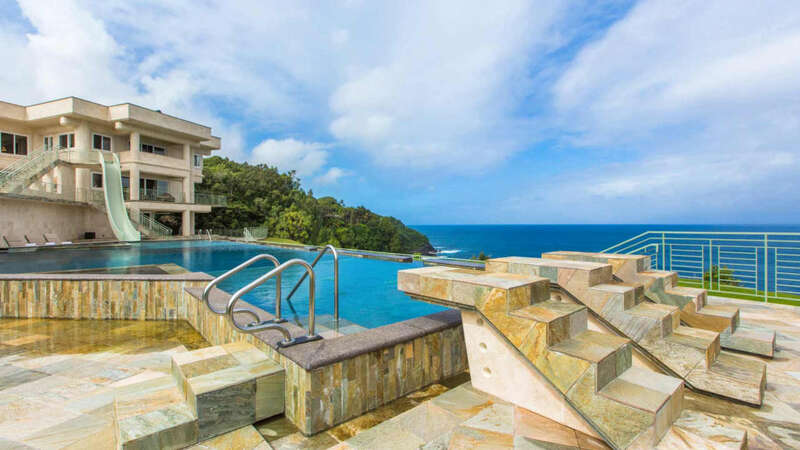 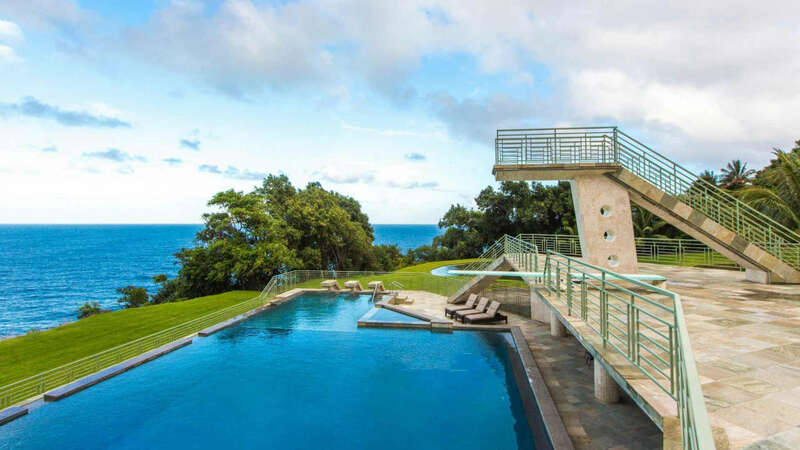 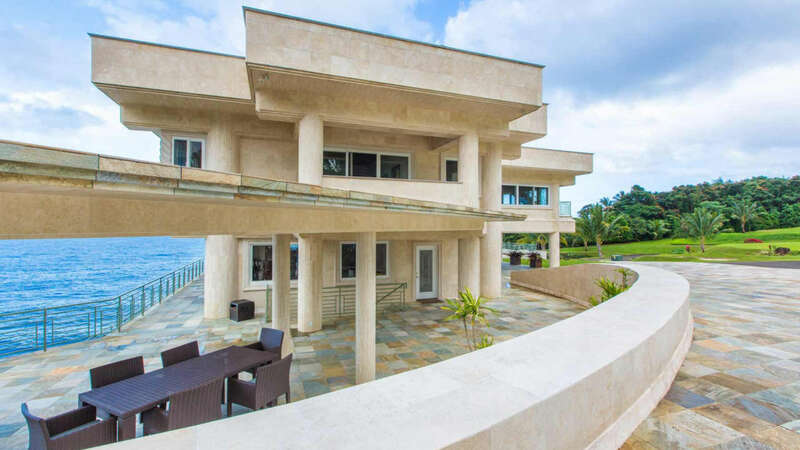 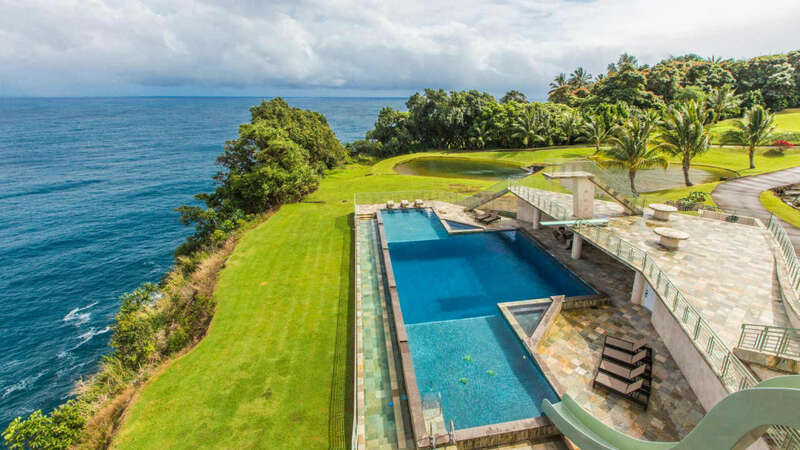 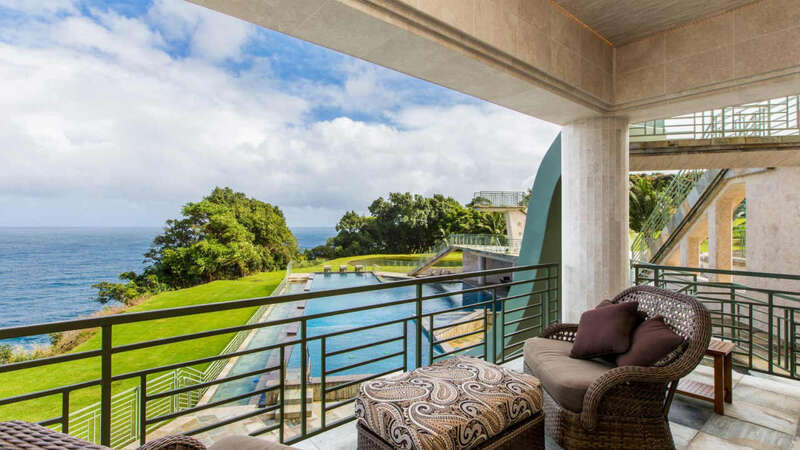 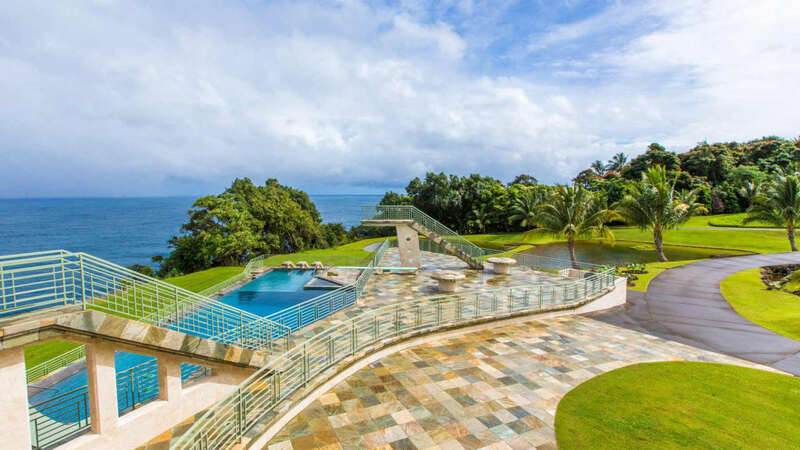 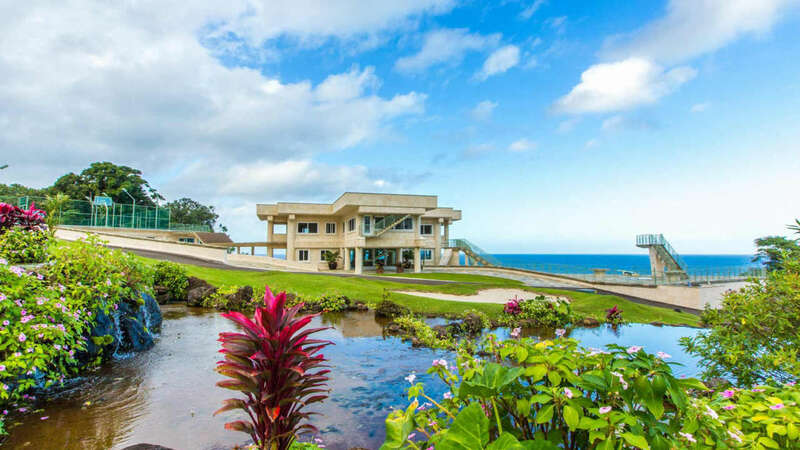 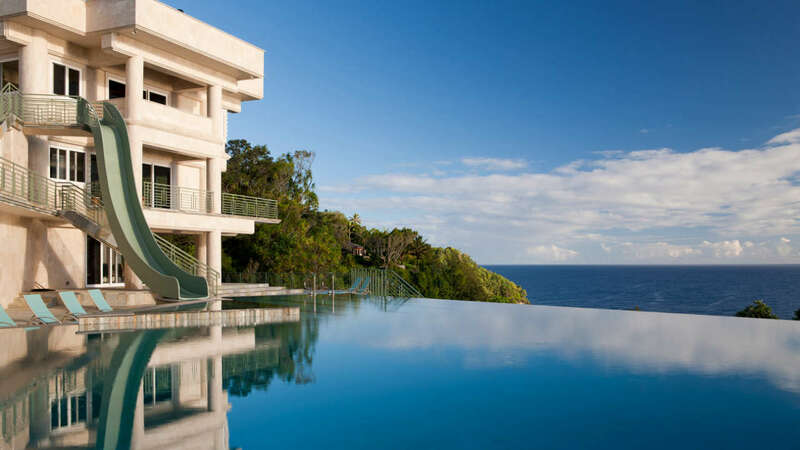 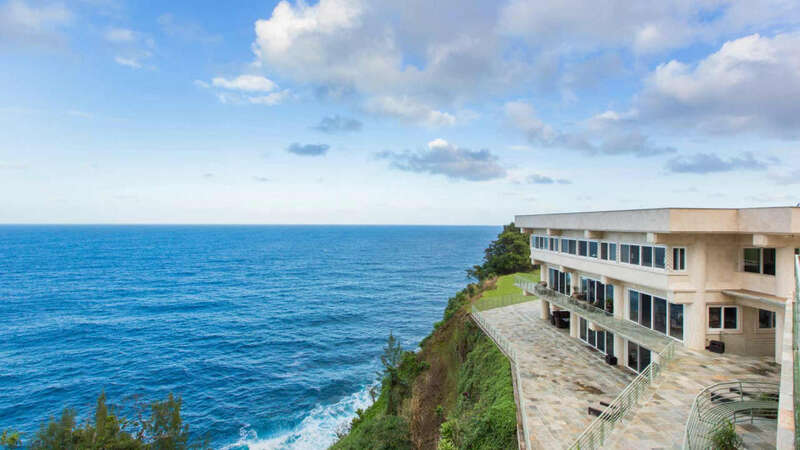 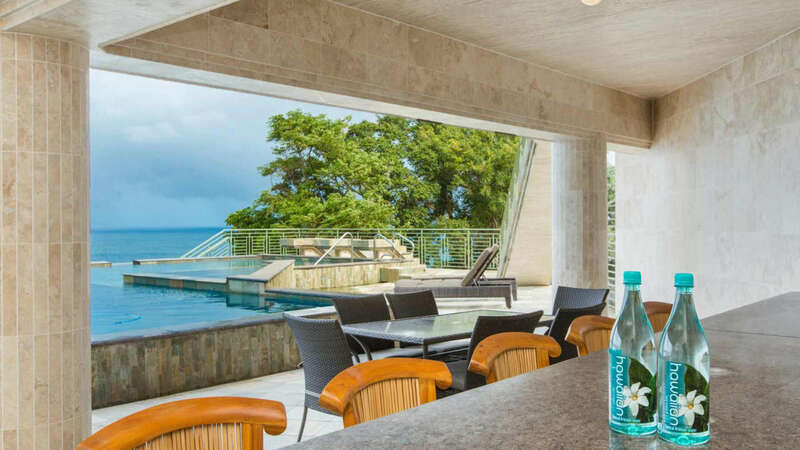 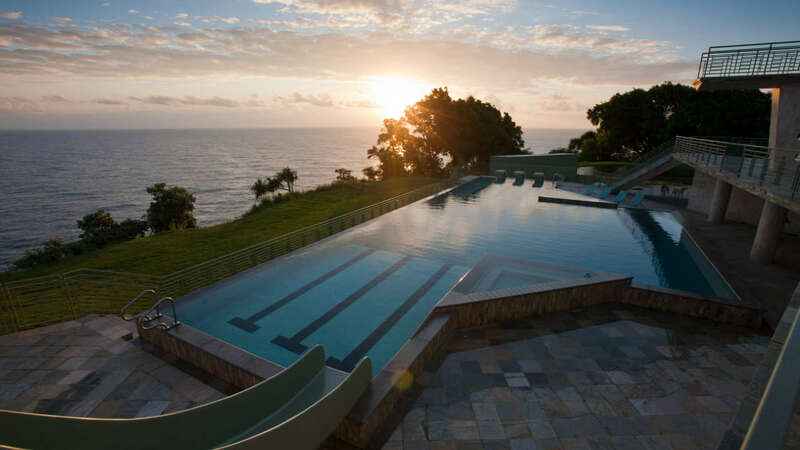 With thundering twin waterfalls, endless ocean vistas, and an Olympic-sized infinity pool, Waterfalling Estate is one of the most striking properties ever developed in Hawaii. 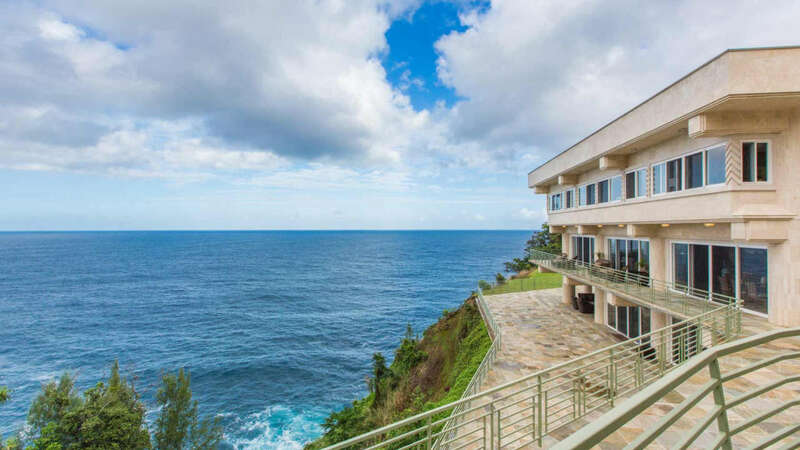 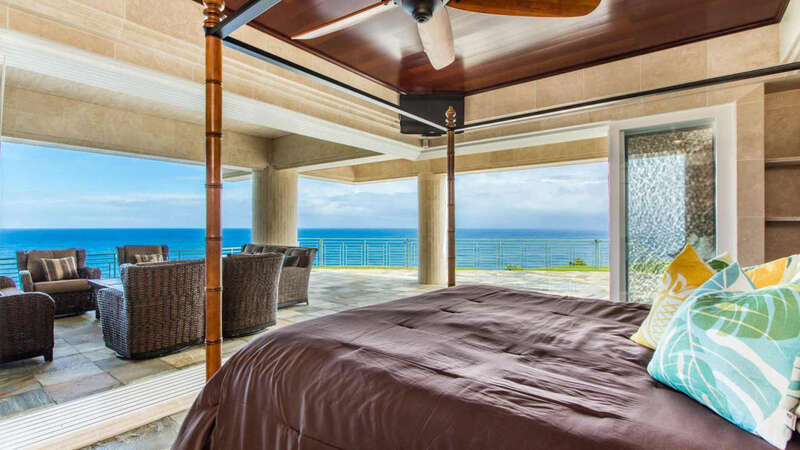 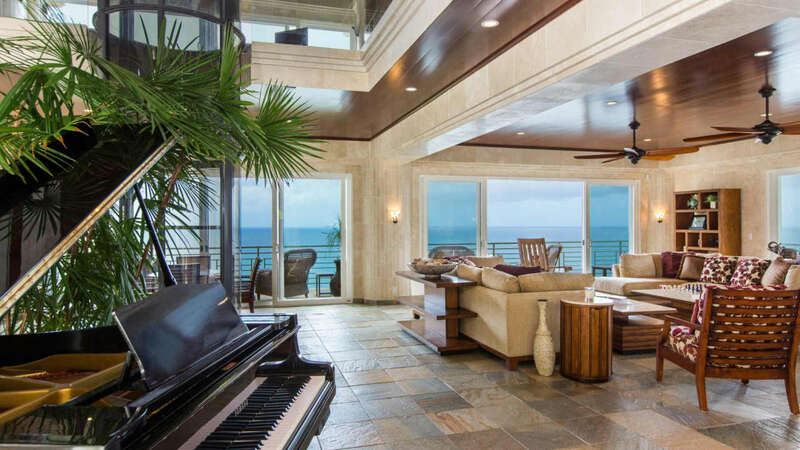 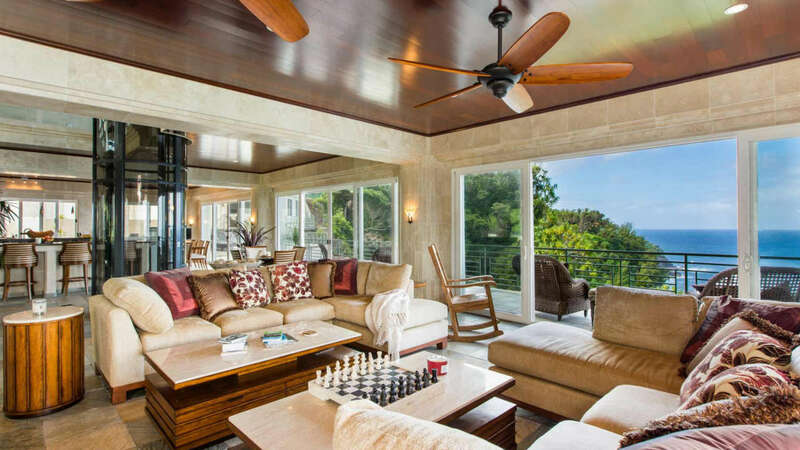 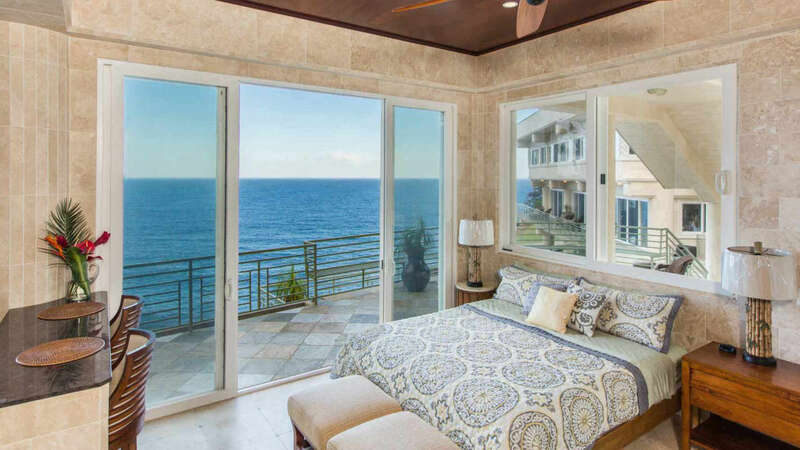 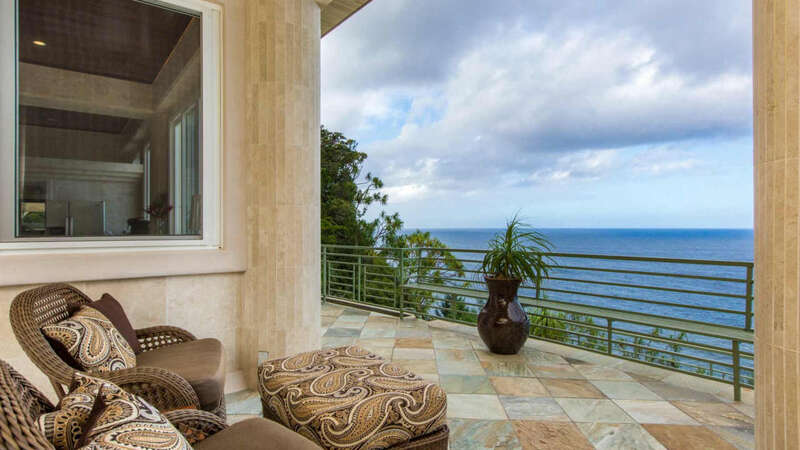 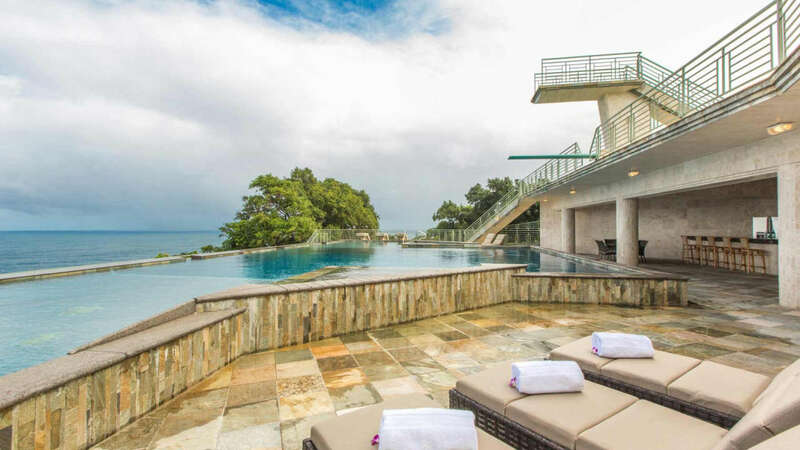 Named for its most distinctive feature, two breathtaking waterfalls, the estate boasts a robust list of unique and luxurious amenities and is found on a stunning ocean bluff, providing ocean and waterfall views from every room. 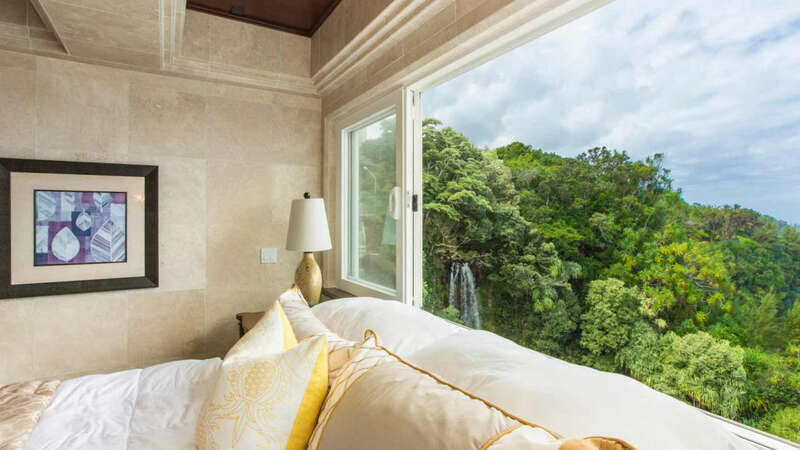 Waterfalling Estate itself is a spacious 10,000 square feet and features 5 suites; 4 suites found in the Main House, and the 5th found in the separate Guest House. 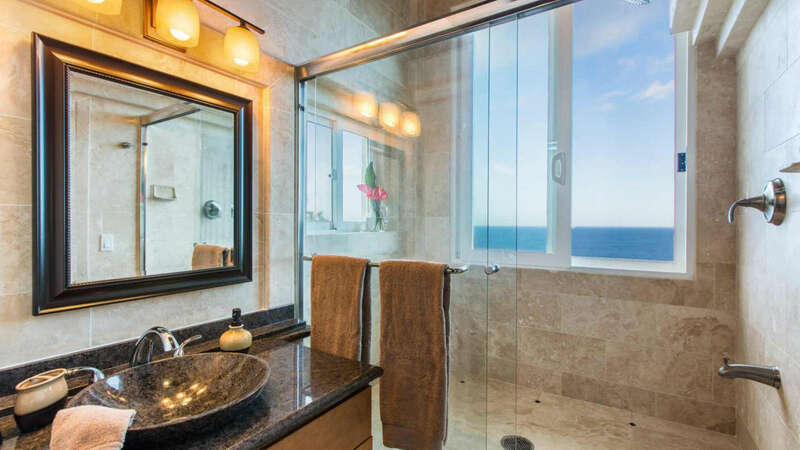 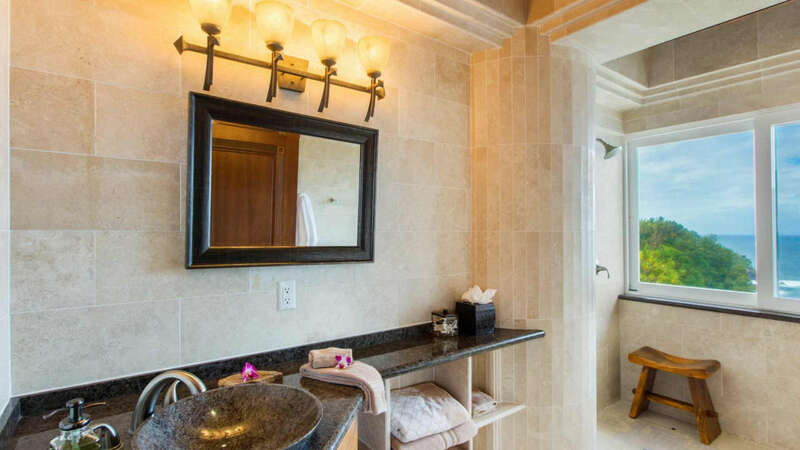 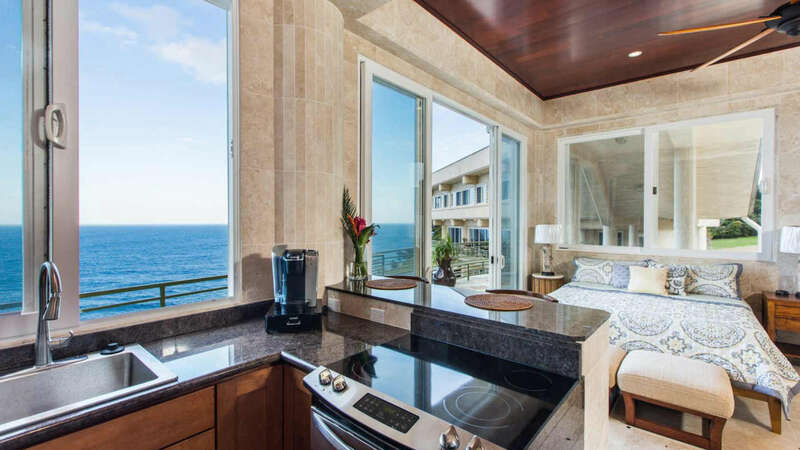 Each suite features 180-degree ocean views, an ensuite bath, and lanai access. 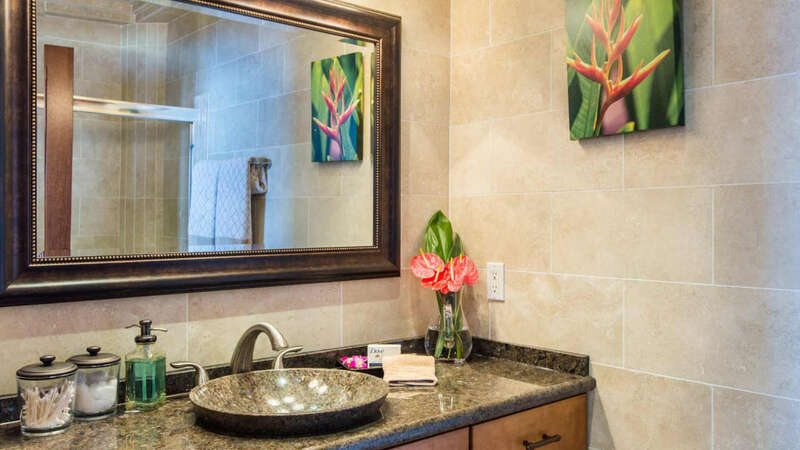 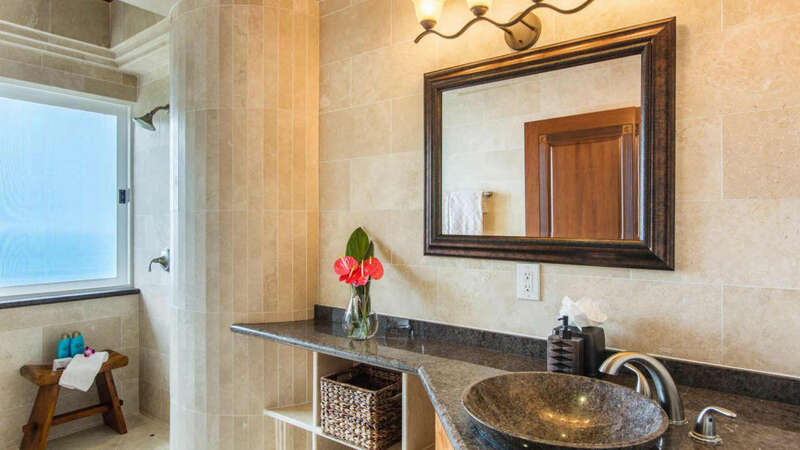 Waterfalling Estate has a total of 7 full bathrooms and 3 half baths. 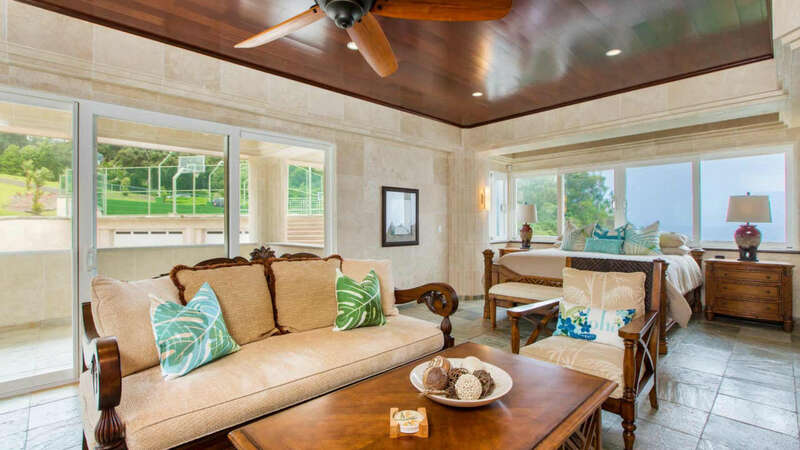 The Estate’s interior features are just as luxurious as the view. 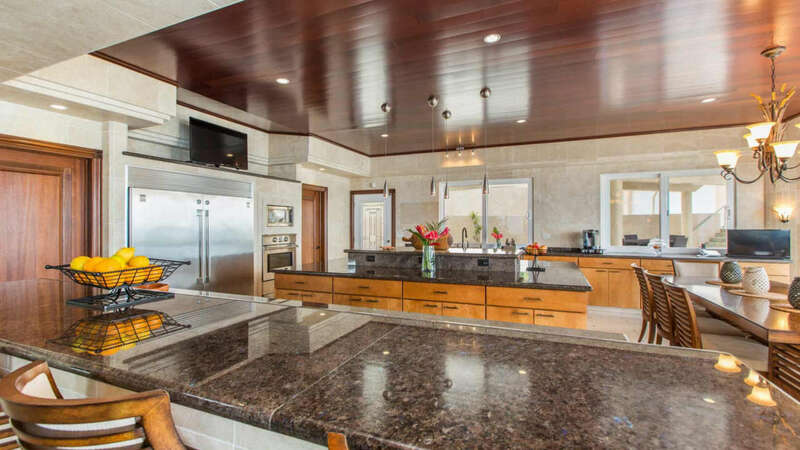 The main floor of the home features a living area, a gourmet chef’s kitchen with stainless steel appliances, a dining area, and a full wet bar that is perfect for entertaining. 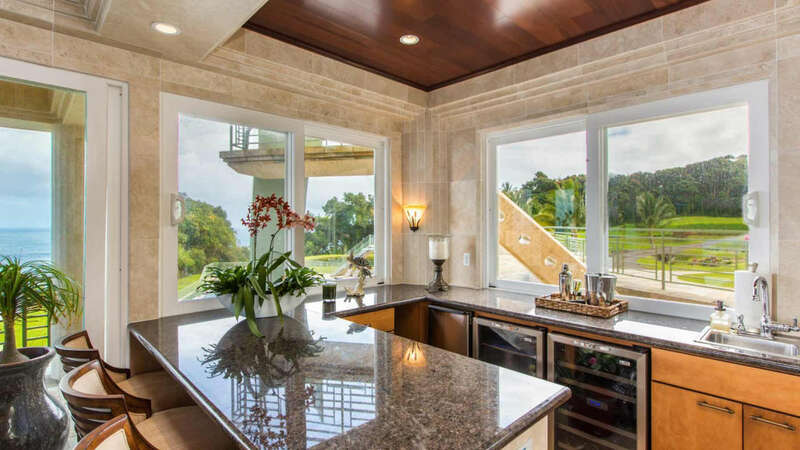 Much of the interior of the Estate is paved with Travertine tile, the same material used by Michelangelo in St. Peter’s Basilica. 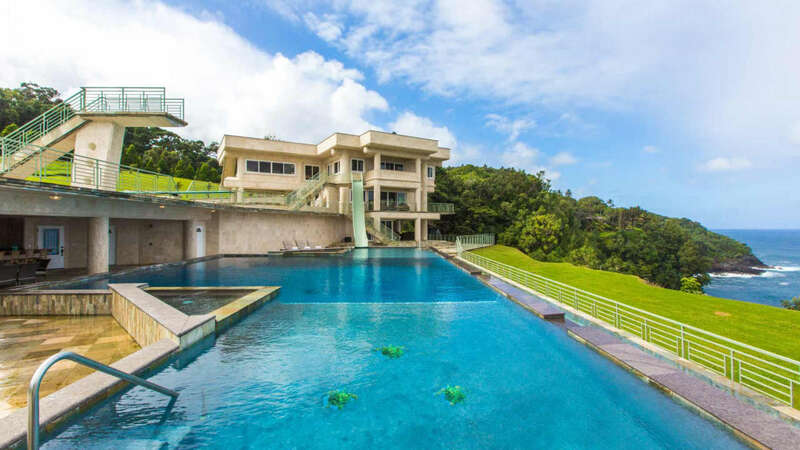 The three levels of Waterfalling Estate are connected by the unique glass-encased pneumatic elevator. 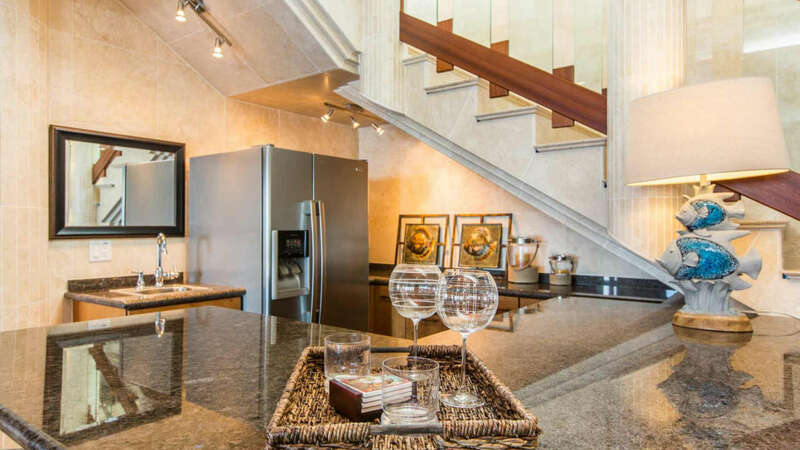 Take the elevator to the Penthouse level of this estate to access the dual master suites. 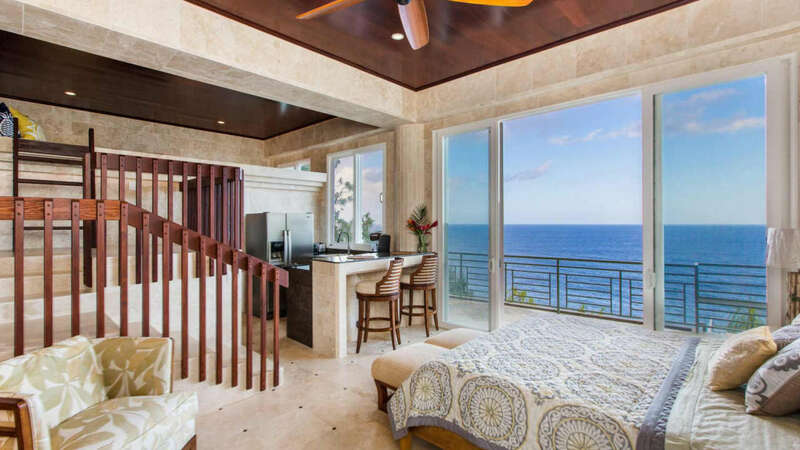 The first Master Suite features a king bed, ensuite bath with stand-alone shower and jetted tub, a TV, air conditioning, and a ceiling fan. 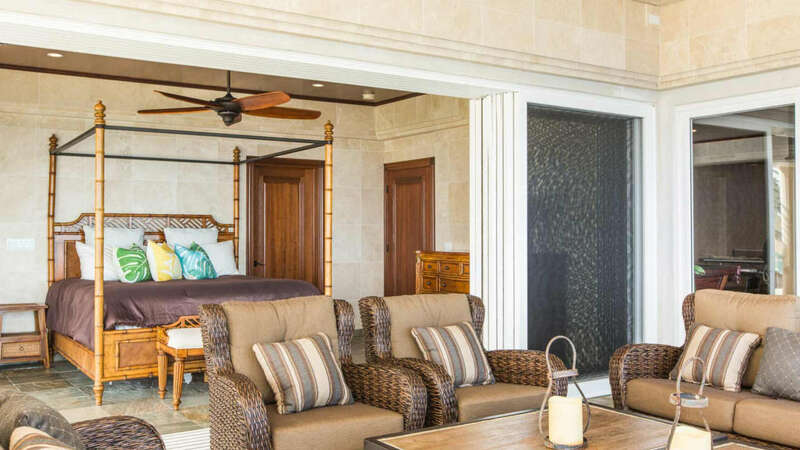 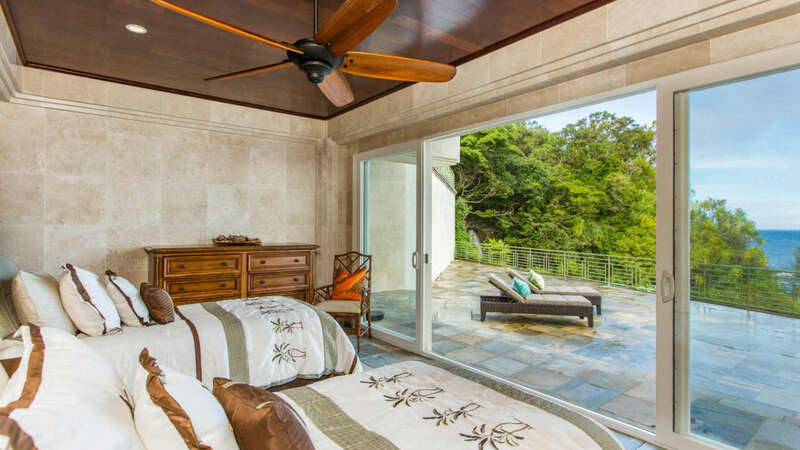 The second Master Suite offers a king bed, ensuite bath with stand-alone shower and jetted tub, TV, air conditioning, ceiling fan, and direct access to the Terrace. 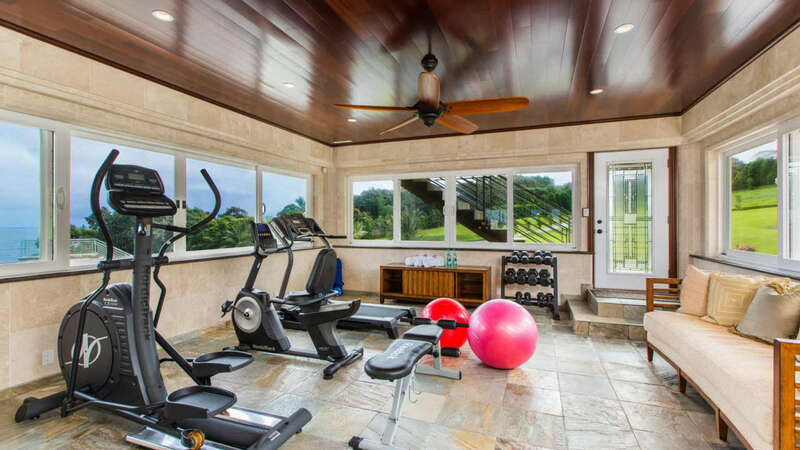 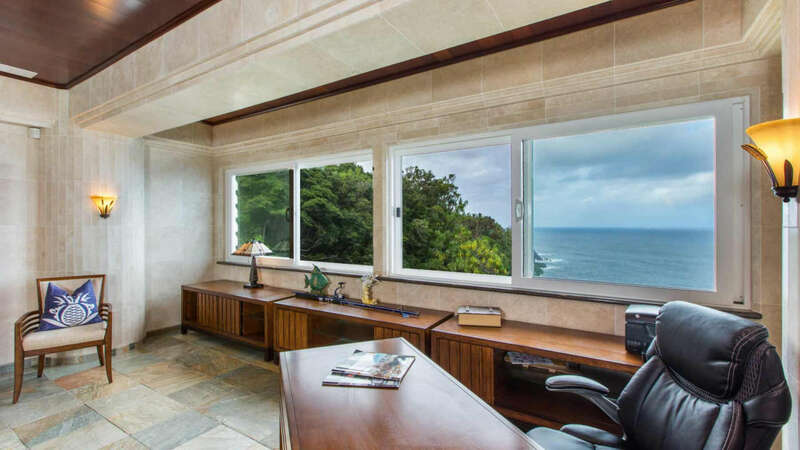 This second level also features a centrally located fitness room and an executive office overlooking the Pacific. 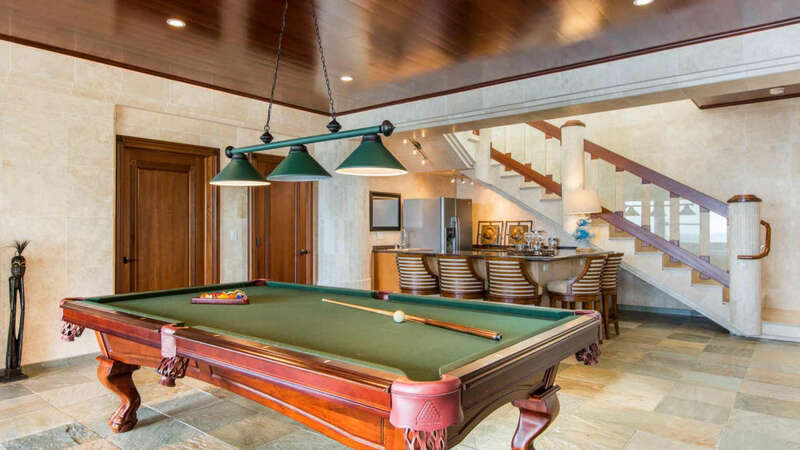 Take the elevator to the lower “pool level” for access to two additional suites. 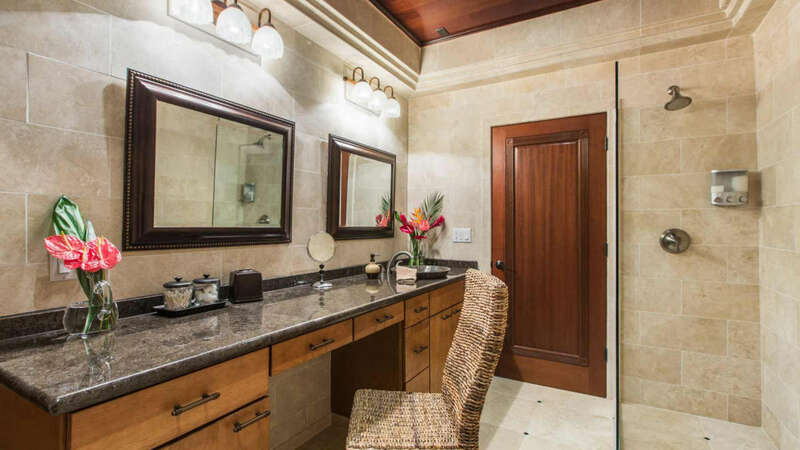 The first Guest Suite offers two twin beds, an ensuite bath, a TV and ceiling fan. 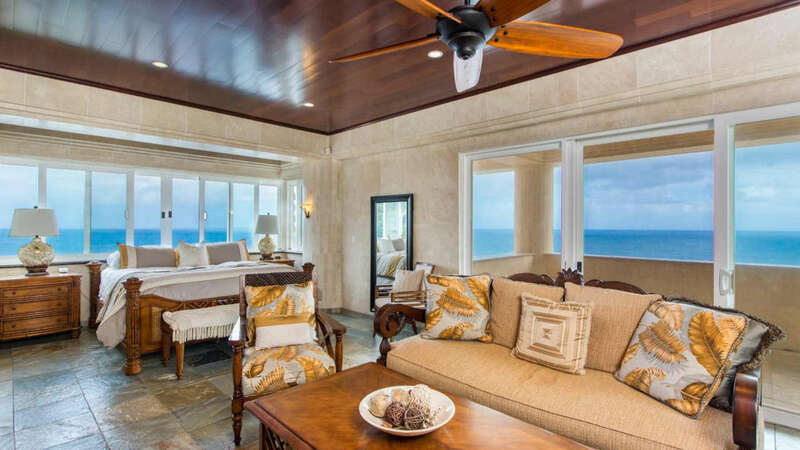 The second Guest Suite features a king bed, ensuite with stand-alone shower, TV, ceiling fan, and direct access to the Terrace. 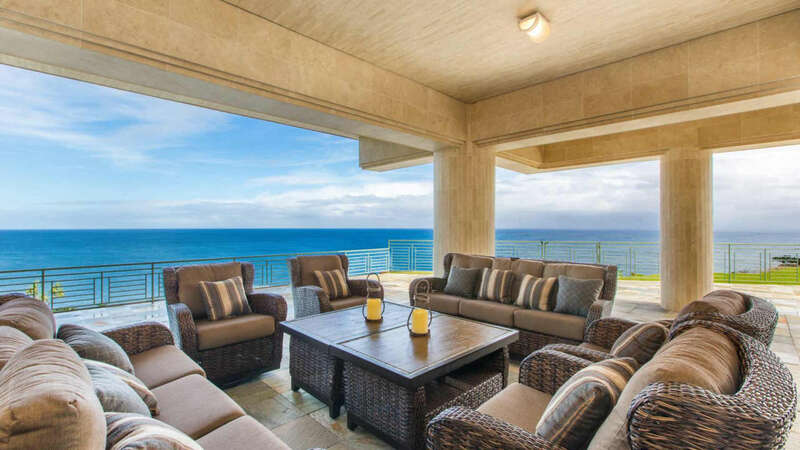 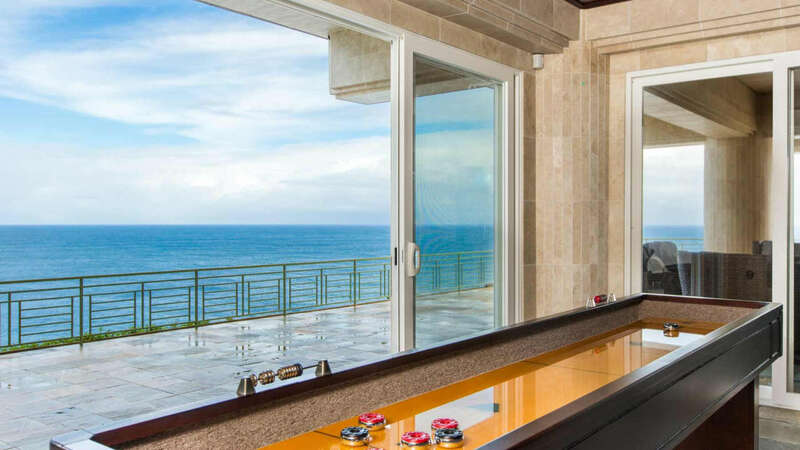 On this level, you’ll also find the game room and bar, featuring unobstructed ocean views and refreshing coastal breezes through telescoping doors. 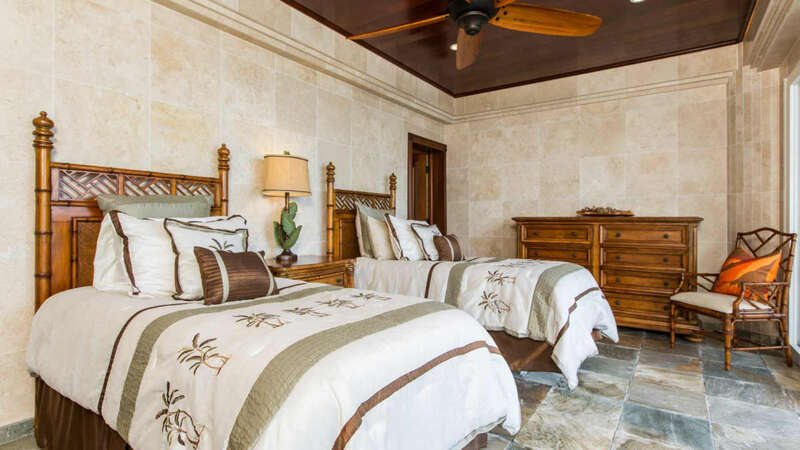 The separate guest house features a living and dining area with the bedroom offering a king bed and queen bed, as well as an ensuite bath. 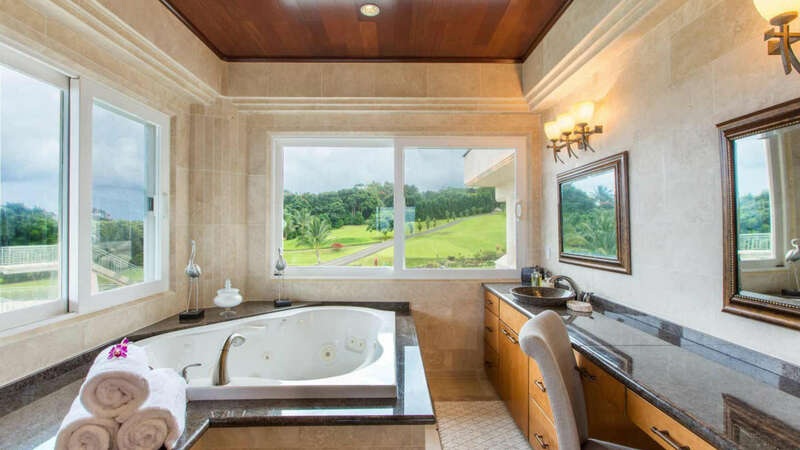 The estate is equipped with world class amenities on its superbly manicured grounds. 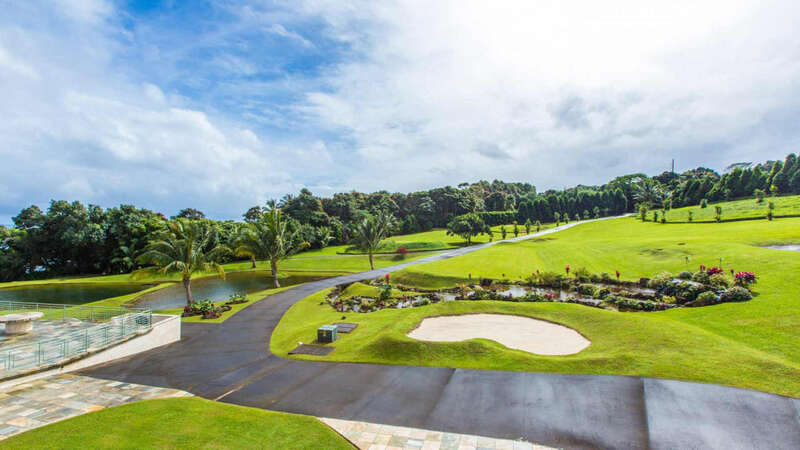 For the sports enthusiast, the Estate features your own private 9-hole golf course, perfect for a quick round with family and friends. 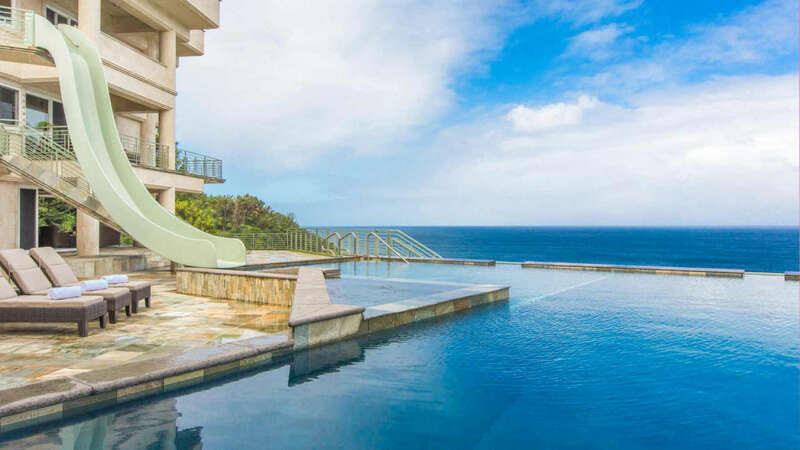 Take a dip in the Olympic-sized infinity pool and 2 hot tubs, jump off the 32-ft high dive and spring board, and race off the Olympic-level starting blocks. 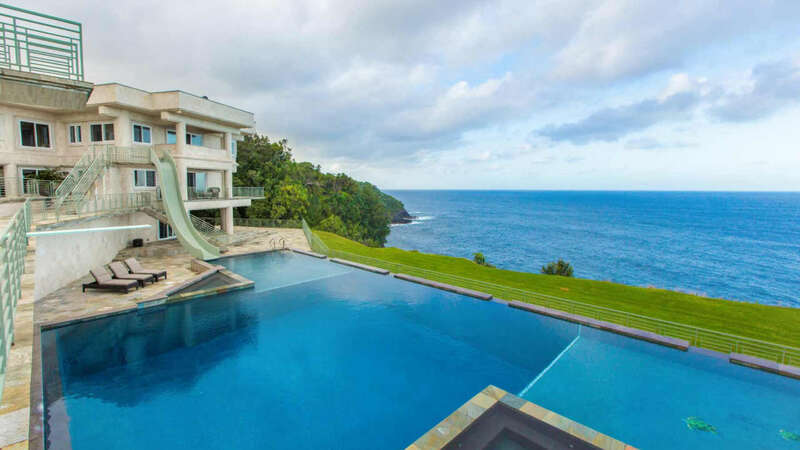 The kids can splash in the 25-meter kiddie pool, or slide down the unique 2-story waterslide. 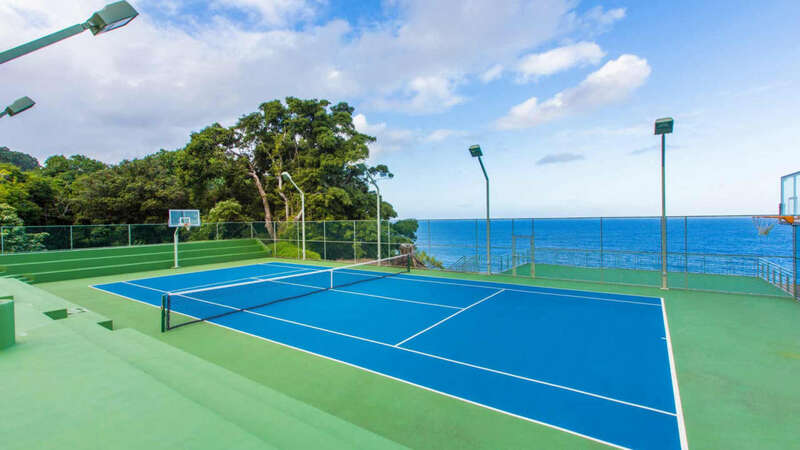 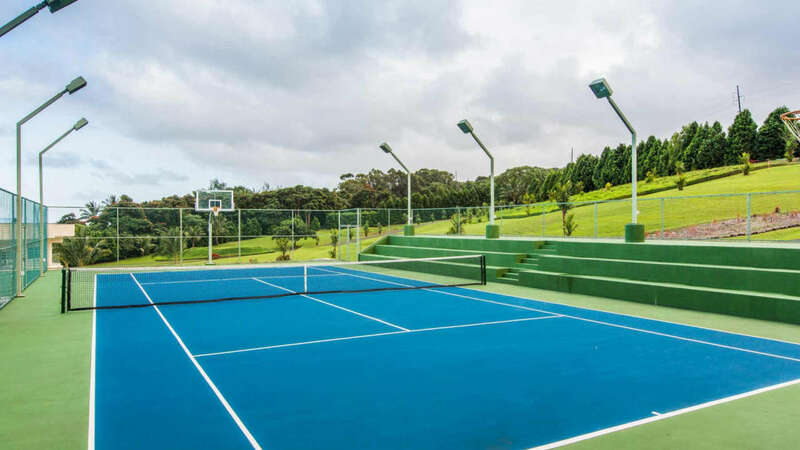 You’ll also find a tennis & basketball court with stadium seating for 450 spectators. 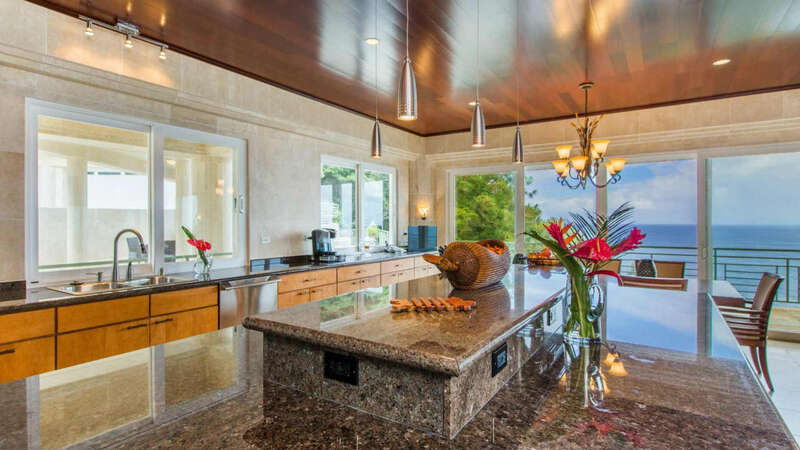 The covered lanai features a wet bar, exterior grill, and dining area. 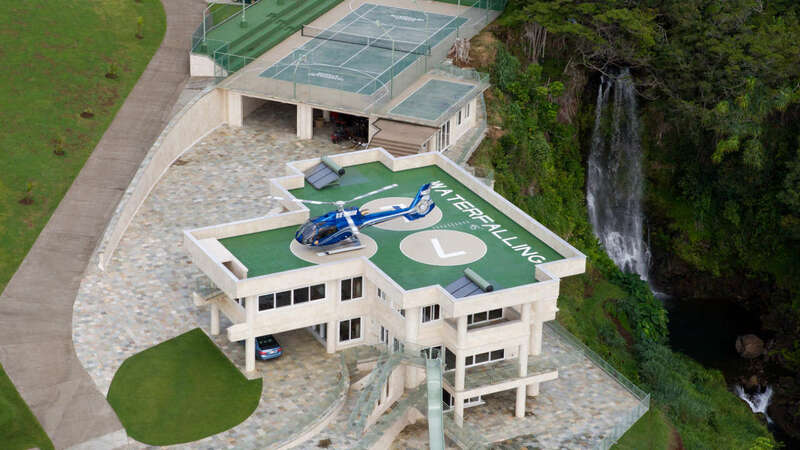 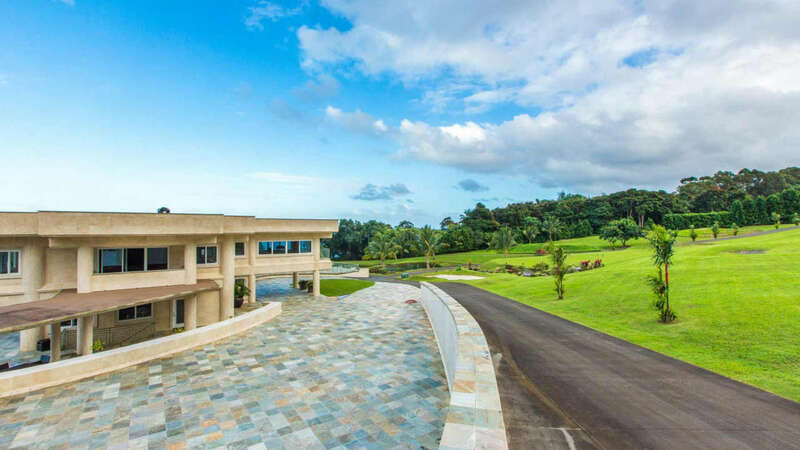 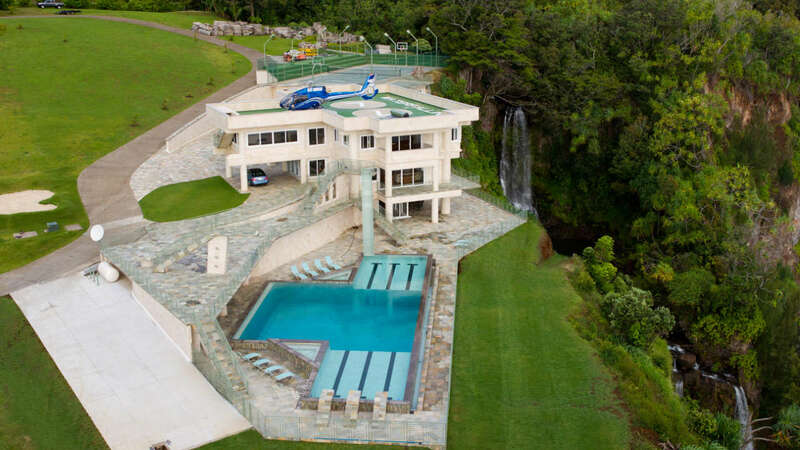 Waterfalling Estate keeps the luxurious amenities coming with a rooftop deck featuring three helipads; the Kilauea Volcano is just a 15-minute helicopter flight away! 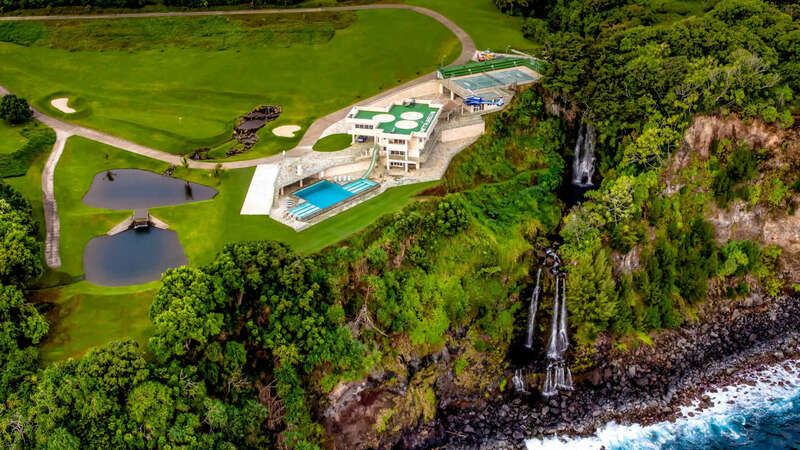 After enjoying the view from the rooftop deck and lanai, you may want a closer glimpse at Waterfalling Estate’s namesake. 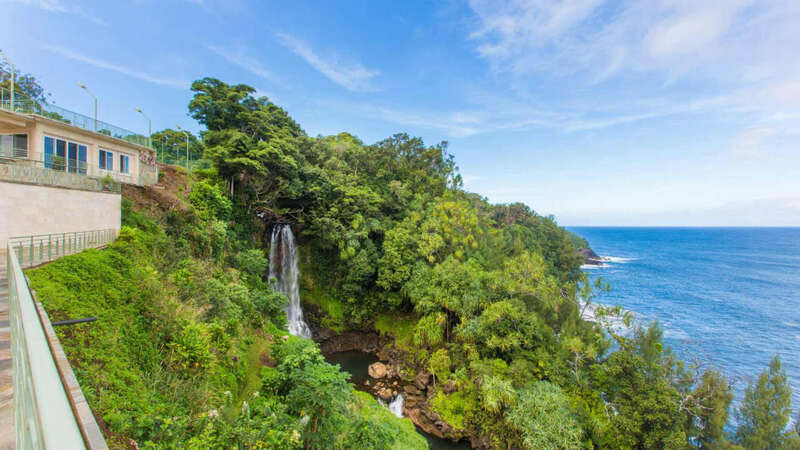 Walk down your private path to the awe-inspiring, rushing waterfall cascading down into natural freshwater pools. 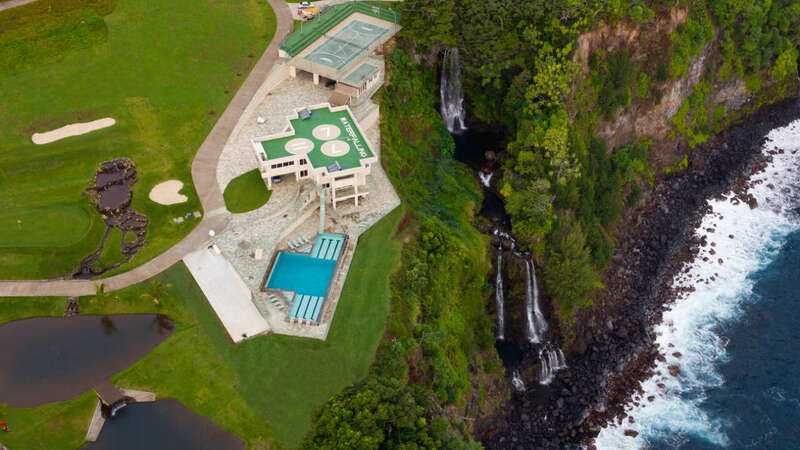 Surround yourself by the lush tropical rain forest at the edge of paradise at Waterfalling Estate.